Thai food- a far cry from what you may order in the U.K. Regularly, I pick up the phone and order a number 77 from my local Thai take-away, making me expert on Thai cuisine – right? Wrong. I, like many other naïve travellers, went to Thailand convinced I knew what to expect when it came to the food that the country offered. 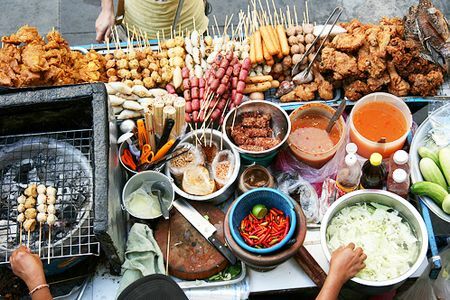 Surrounded by the loud sounds of Ko San Road in Bangkok, expect to smell the street food wafting around you. Meat skewers seasoned with assorted spices, mango sticky rice and khanom bueang (tiny sweet tacos) … the list is endless. The stalls are crammed with a variety of food and all are offered at a fantastic price. Surely restaurant food is familiar? Again, I was wrong. Although you may recognise a few of the dishes, there will be many that are unfamiliar. If you are a fan of spice, the Thai are happy to push you to your limit. However, they often need convincing because they worry that European travellers ‘can’t handle it’. – Massaman curry (kaeng matsaman) – An Indian style curry containing roasted dried spices. These currys often contain potato and are truly delicious – a personal favourite. – Green curry (kaeng khiao wan)– A green curry (hence the name) made with green chillies and coconut milk. This is probably the one you have tried at home. – Thai fried rice – rice fried with egg, onions and garlic and (sometimes) with pineapple. 1. Slice the beef into thin pieces, about about 1/3″ (3 cm) thick. 2. Saute the green curry paste in oil over medium heat in a wok or saute pan until fragrant, reduce the heat, gradually add 1 1/2 cups of the coconut milk a little at a time, stir until a film of green oil surfaces. 3. Add the beef and kaffir lime leaves, continue cooking for 3 minutes until fragrant and the beef is cooked through. Transfer to a large pot, place over medium heat and cook until boiling. Add the remaining coconut milk, season with palm sugar and fish sauce. When the mixture returns to a boil add the eggplants. Cook until the eggplants are done, sprinkle sweet basil leaves and red chilies over, then turn off the heat. 4. Arrange on a serving dish and garnish with sweet basil leaves and red chilies before serving. Note: *Miniature red bell peppers or other mild red pepper may be used in place of the spur chillies. Oyster Worldwide have a number of projects in Thailand. What better way to immerse yourself in the culinary delights of the country than living there and taking part in a life changing experience. To find out more, read here.